Are you finally ready to take the plunge for that new kitchen you’ve always wanted? At Hermitage Kitchen Design Gallery, we’ll help you with that process, from the beginning to the end. One of our designers will sit down with you and go over everything that will help you with your decision. We design beautiful and unique kitchens and bathrooms tailored specifically to meet the needs of you and your family. Our staff includes two Certified Kitchen Designers, paired up as a team to provide creative solutions with meticulous detail for your project. The main advantage to using custom cabinetry in your kitchen is having the most flexibility in style, material and finishes. They are completely made to order and so we’re able to tailor the size and design in order to suit the needs of your specific kitchen. Even the most unique or challenging space can be fit with custom cabinetry in order to make it a functional kitchen. The possibilities are endless for the number, size, shape, depth, finishes and accessories, so you’re sure to end up with a space that’s tailor-made for your cooking and dining needs. How about a new bathroom or office? We can do that. We’ve done bathrooms that the owner didn’t realize how much space there really was until it was finished. Melissa Morgan Sutherland, one of our Certified Kitchen Designers (CKD), was touched when a husband-and-wife client came to her with a dilemma: they were tired of the master bath design they had lived with for 10 years that divided the space into his and hers sections. “The clients were this sweet couple who wanted to be together more, but their bathroom had two distinct entrances plus closets in the center that separated them when using the space,” Sutherland explains. The first thing she tackled was getting rid of the closets in the center, which opened up a huge amount of space for her to play with. 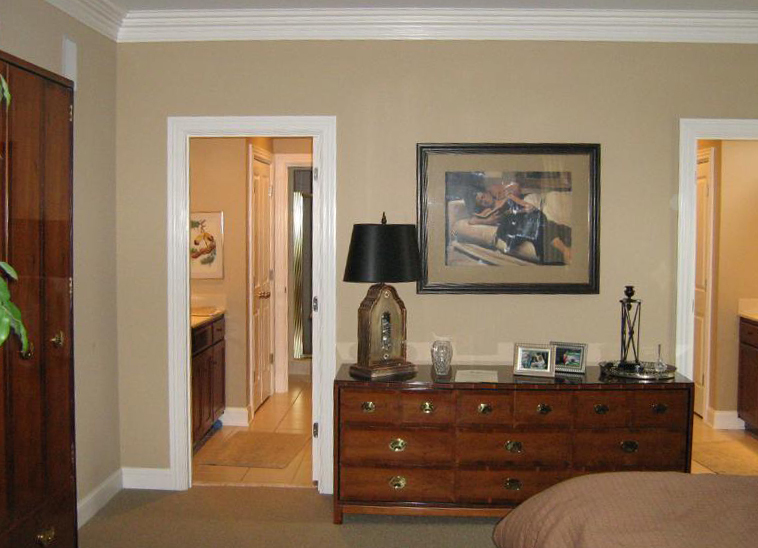 By relocating the closet areas to the perimeter walls, her clients didn’t lose an inch of storage space and instead gained an incredible amount of room. 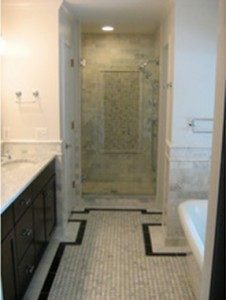 By removing the separate doorways to create one grand entrance with pocket doors, Sutherland had enough room to create a larger, more sumptuous area for the tub. She widened the existing tiny window above the tub to bring in even more natural light that heightens the feeling of a spa retreat during the bathing experience. There was even enough room to install a separate shower room, complete with a wet location-listed halogen down light plus a generously proportioned window without sacrificing privacy. Those changes were dramatic enough, but Sutherland had a few more design tricks up her sleeve. She created additional storage by lowering the shower height and creating an accessible, yet enclosed, niche area above it where the clients could store unused luggage that had been taking up space. 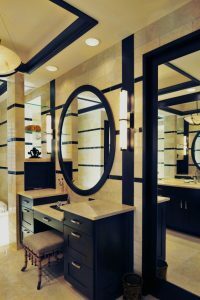 To enhance the look of the luxurious materials in the master bath, Sutherland knew she needed to install great lighting. To bring out dimension in the tray ceilings, she employed LED rope lights. 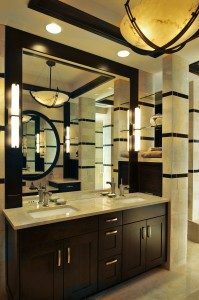 Halogen down lights from Juno Lighting offer ambient illumination over the sink and vanity areas, while vertical sconces by the George Kovacs division of Minka Group flank the mirror to provide even illumination for grooming tasks. What gets the most attention, however, is the giant centerpiece bowl pendant from Justice Design Group. 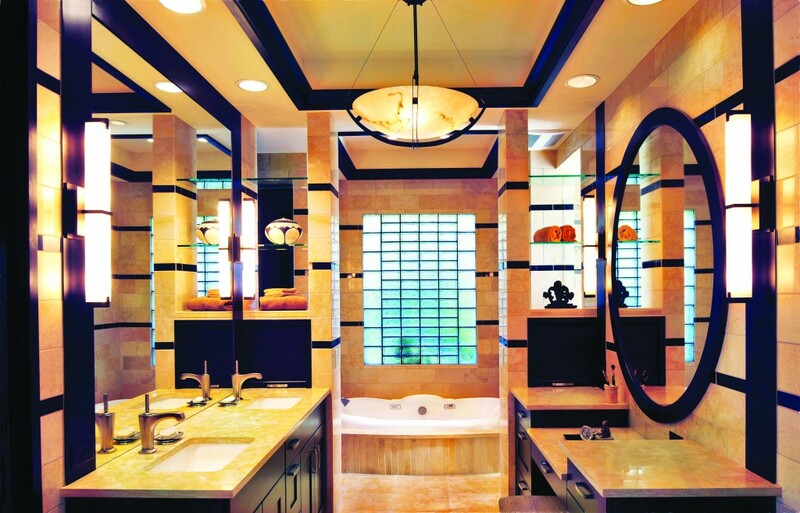 The difference between the “before” bathroom and the “after” was dramatic enough to win over the judges of the 2011 National Kitchen & Bath Association (NKBA) Design Competition. Among the 500 entries considered for the Before-and-After category, Sutherland’s project was deemed the best. Terri Sears, CKD, another Designer on staff, had her own challenge. 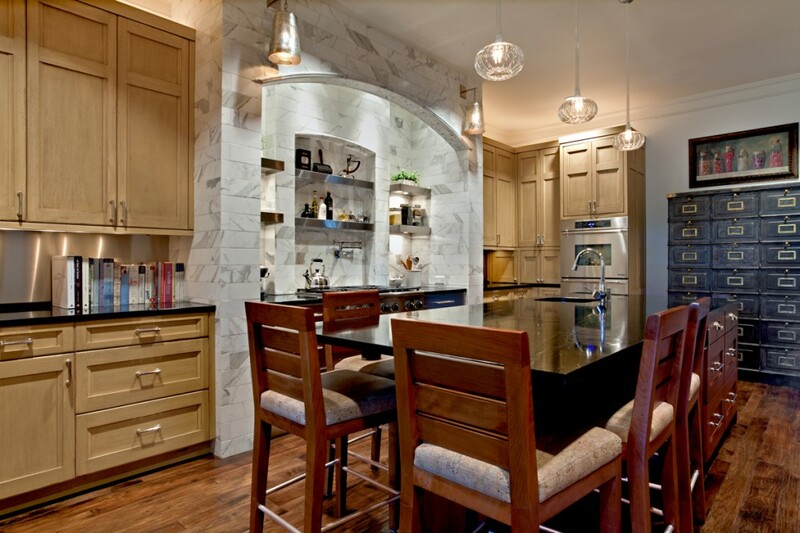 “This client and I had worked together on her kitchen a few years prior to this project. This is the master bathroom, and they realized that the original shower had been leaking under the house for about 2 years. They had Serve Pro come out to assess the damage to realize that they needed an entirely new shower. We got together and made a nightmare into a dream come true. We tore everything out of this room and replaced some rotten joists and sub floor. The clients are so pleased with the new space!” Sears explained. If you are a homeowner with an unusual kitchen space or distinctive design style, custom cabinets may be just what you are looking for. 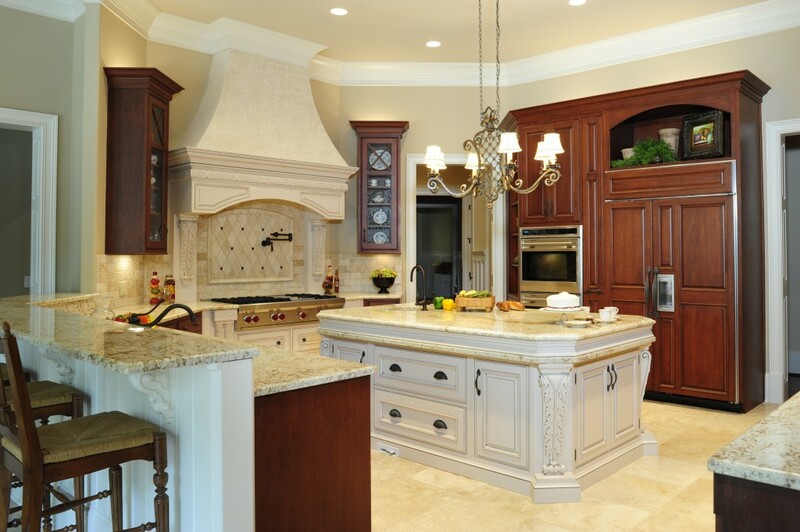 Creative freedom coupled with quality craftsmanship makes custom cabinetry an appealing choice. 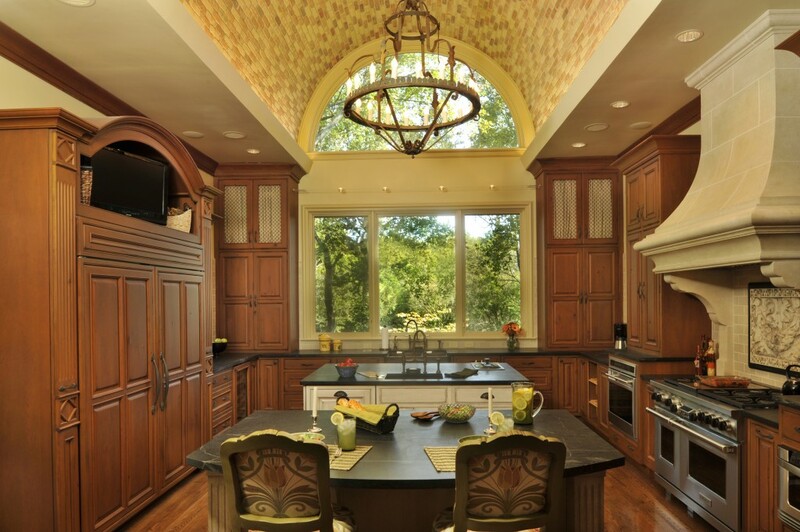 We pair our designs with custom cabinetry manufacturers whose commitment to crafting timeless kitchens mirrors our own. We offer green products, several which have a lifetime warranty. 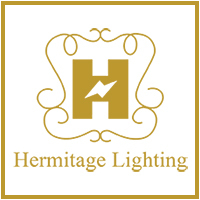 Hermitage Lighting Gallery has been providing design, lighting and appliances all in one place for 70 years.